Two years after leveling the expectations of critics and listeners alike with Atma, doom trio powerhouse YOB unleashed Clearing The Path To Ascend (2014), an aptly titled album for what may be the crowning achievement for a band whose journey now nears two decades of creating music as commanding as it is cathartic. As is the YOB way, the tracks here don’t simply offer a vacuous glimpse into the already riff-soaked doom genre. These songs demand the tandem attention of mind, body, and soul – etching a mark across a sound that finds YOB as formidable and unequaled as they’ve ever been. The path to ascend is always an arduous one, fraught with the peril of mediocrity and the constant threat of failure. Thankfully and unsurprisingly, YOB pummels that path, climbing upward into a realm that sets the band in a heavy metal place that has been and will always remain wholly their own. [...] Those threads of progressive rock and drone that have always underscored the music of YOB are now fully realized with Clearing The Path To Ascend, as each track forges into the next with a ferocity that’s as completely unhinged as it is utterly focused. Drummer Travis Foster wields his signature rhythmic furor here with bombastic precision while bassist, Aaron Rieseberg, coils around the sonic tide with an unforgiving churn – all the while in a deadly synchronicity with Scheidt’s uncanny vocal range and its pendulous movement between the triumphant howls of a medieval madman and the earth splitting growls of a war-battered titan. With Clearing The Path To Ascend, YOB explores a thunderous dimension that’s familiar in its auditory clout but completely new in the execution of its trajectory, taking the band’s sound into a remarkable place as ethereally compelling in its aesthetic as it is merciless in the magnitude of its sound. Smashing up from the Bay Area underground, Black Cobra is ready to take the heavy music world by storm. Formed in 2002 by Rafa Martinez (Acid King, -16-) and Jason Landrian (ex-Cavity) this duo has been laying waste to audiences, taking on all comers, and leaving the remains to rot in their wake. Their sound is a crushing mix of High On Fire-tinged stoner metal and Buzzov*en's Southern-fried sludge, with a heaping dash of Melvins-style drone to wash it all down. The two piece is the product of years of work between Jason and Rafa. Both originally from Miami, Florida, work started on Black Cobra while home visiting parents over the holidays. This lead to the trading of a series riffs through the mail and visits to each others residences in NY and LA for sporadic practices. The year 2004 saw the release of a raging 3 song demo maxing out at a whopping 6 minutes in length. The year 2006 saw the release of the 11 song goliath that is Bestial followed by relentless touring in America and Europe. In 2007, the band relocated to San Francisco and released their second album Feather & Stone taking the band to Japan for the first time and again touring Europe and America extensively. [...] Released in October 2011, BLACK COBRA’s fourth LP Invernal was one of the most critically acclaimed releases to emerge from the metal/sludge scene that year. Recorded at Converge guitarist Kurt Ballou’s God City Studio and mastered by John Golden (Neurosis, Melvins, Weedeater), the album propelled the most diversified and matured songwriting from the duo to date forward with incredibly thunderous production, the theme to the entire record based on a post-apocalyptic trek to a nuclear infested and mutated Antarctica, inspired in part by the treks of English researcher Ernest Shackleton. The band perpetually toured through the year surpassing their 600th show mark in 2012 since the release of their debut LP Bestial in 2006. Anyone who caught the national television debut of Nathaniel Rateliff & The Night Sweats on The Tonight Show recently witnessed something special: the arrival of a force of nature. The song was titled "S.O.B." Rateliff, backed by his gritty band — which comes complete with an organist and a horn section — veered from whispery pleas to ecclesiastical howls. The born-again spirit of vintage soul music poured out of the man, measurable mostly in gallons. Then he danced. His message? Simple: He preached the gospel of bacchanalian abandon. The stage was his pulpit, and from it he thundered. Nathaniel Rateliff & The Night Sweats' self-titled debut album is coming out on Stax, the Memphis birthplace of so much legendary R&B, from Otis Redding to Isaac Hayes. It's an honor to walk among that company, and it also makes perfect sense: Although a longtime resident of Denver, Rateliff grew up in rural Missouri. And, while that's not technically the South, it's close enough to Memphis to matter. Like the Stax belters of yore, Rateliff channels the earthiness and funk of the American experience: "S.O.B." and its profane refrain may seem like little more than a five-alarm party at first glance, but there's a profound, even poignant unleashing of sorrow at its heart. Rateliff is also an accomplished solo singer-songwriter — more of the introspective, acoustic variety — but The Night Sweats' music is where he unleashes his swaggering, after-dark persona. Folk revivalists come cheap these days, but The Night Sweats' members tap into a different strain of Americana: There's a hint of Booker T & The M.G. 's — Stax's first, iconic house band — to the propulsive plaintiveness of "I Never Get Old," one of The Night Sweats' most tuneful, heartfelt tracks. Doused with reverb and regret, "Look It Here" simmers in a stew of bittersweet soul; "Mellow Out" is Rateliff's "(Sittin' On) The Dock Of The Bay," a gently strummed ballad that lets slip more than a little tenderness. For the most part, though, The Night Sweats is an upbeat, old-time dance record — unpolished and unapologetic. Staying still during the stomping rawness of "Trying Hard Not To Know" is like trying to keep a lid on a kettle of popcorn. And if the shimmering, near-psychedelic sultriness of "Shake" doesn't turn the world into a groovy love-in, there may be no hope for any of us. Rateliff isn't simply resurrecting the ghost of R&B past like some garden-variety neo-soul necromancer: He's out to shake the sheets, sermonize and get downright elemental. Originally hailing from Chicago, Fruit Bats featured an ever-changing lineup based around the folk-pop songwriting of bandleader Eric Johnson (not to be confused with the Eric Johnson from Archers of Loaf or the guitar virtuoso of the same name). Johnson began writing songs on his four-track in the mid-'90s before forming I Rowboat, a Velvet Underground-inspired indie rock band. He also began dabbling in folk music with two of the band's members, guitarist Dan Strack and drummer Brian Belval, thus forming the earliest incarnation of the Fruit Bats. When I Rowboat disbanded, Johnson continued to widen his network by playing guitar and banjo with Califone. Bandmates Tim Rutili and Ben Massarella (who also owned Perishable Records) urged Fruit Bats to record an album for their label, which resulted in the trio's 2001 debut, Echolocation. Over the next two years, the group toured and refined its lineup, adding multi-instrumentalist Gillian Lisee to the fold while embracing more elements of pop and experimental rock. In 2002, Fruit Bats signed with Sub Pop and released their sophomore effort, Mouthfuls, the following spring. Two years later, having relocated to Seattle and expanded to a quartet, the band released Spelled in Bones. The album continued moving away from the folk-rock foundation of Echolocation, although elements of that rootsy sound remained. 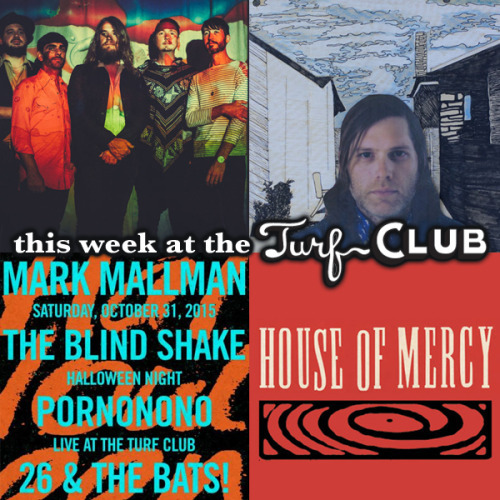 SATURDAY: Mark Mallman | The Blind Shake | Pornonono | 26 & The Bats! There is a line between insanity and genius that Minneapolis musician Mark Mallman has built a career on. His solid songwriting, combined with a wild stage persona, has earned him opening spots on stages with artists as diverse as Green Day, Cat Power and Guided By Voices to name just a few. Mallman’s expansive catalog of infinitely catchy, masterfully orchestrated boot-stomping pop songs has rocked the airwaves of MTV, VH1, NPR, and dozens of major motion picture trailers and video games. Mallman has also been written about in Rolling Stone, Pitchfork, Time Out New York, the L.A. Weekly, Chicago Sun-Times, Denver Post and so on. "The Blind Shake is at once spacey, primitive futuristic, and brutal: a kind of backyard extraterrestrial minimal surf-punk party. One guitar, one baritone guitar, a fuckload of reverb, and a drummer who deserves an Olympic medal." [SF Weekly] Fronted by brothers Jim and Mike Blaha, with friend Dave Roper on drums, the trio have been tunneling through the underground since before telephones could talk. Having six full length albums to their credit, several singles, three collaborations with psych legend Michael Yonkers and another with downstroke warrior John Reis, the band continues to push the sliding scale between catchy punk songs and pitch red noise. They have a brand new EP on Slovenly Records as well as a full-length LP on Goner Records. Pornonono is a local R&B future-myth in search of a time and place we can all dance ourselves into one body and soul. Made up of Aaron Baum, Amy Hager, Jacob Mullis, Jared Isabella, Ben Clark, Pornono puts on a show you definitely need to see. Coming from Minneapolis, Minnesota, 26 & the Bats! captures the unique sound that doesn't quite fit into one genre. Blending D'Angelo, Radiohead, and the Yeah Yeah Yeahs together, they produce a combination of their inspirations and their own authentic twist. The Blood Washed Band is a local alt-country supergroup and the house band at House of Mercy, led by Professor Page Burkum and Brother Quillan Roe. Inspired by old time country gospel songs and hymns, the band’s repertoire includes songs by the Carter Family, the Louvin Brothers, Gram Parsons, Johnny Cash and The Band. In addition to the double-barrel leadership of Prof. Page Burkum, guitarist (Cactus Blossoms), and Bro. Quillan Roe, bassist (Roe Family Singers), other regular members of the band include, violinist Chris Becknell (Mursik), keyboardist Erik Brandt (Urban Hillbilly Quartet), electric guitarist Jeremy Szopinski (Urban Hillbilly Quartet, House of Mercy Band), Levi Stugelmeyer (Charn) on drums and vocalist Angie Talle (House of Mercy Band) and many fabulous mosaics around town). Founded in the spring of 1996, House Of Mercy offers a discriminating blend of high church and low, of tradition and innovation, sincere worship and healthy skepticism. Although the roots of the House of Mercy are in the free church tradition–we began as an American Baptist Church–we are committed to the diverse and rich theology and worship of the Christian church worldwide and historical. While we draw different elements of worship from many Christian ritual traditions–Lutheran (we are affiliated with the Evangelical Lutheran Church in America), Catholic, Anglican, Orthodox, and the free churches–at House of Mercy we seek to create a place where questions are encouraged, where you will not be handed a checklist of orthodoxy, where ambiguity is not the enemy of faith but its partner. You may occasionally be led to suspend your intellect. But you will not be required to sacrifice it.